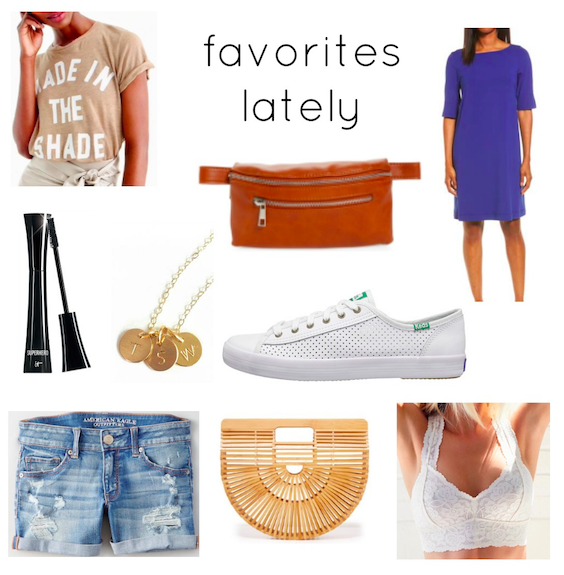 this summer i have had a closet full of essentials that i find myself reaching for all the time so i thought it would be fun to share some things i’ve been loving and using on repeat lately! j. crew made in the shade t-shirt – i’m sure you’ve seen this tee around the web this summer but it’s super soft and cozy and such an easy tee to throw on with anything! faux leather belt bag – you guys. fanny packs are back! i wore them when i was a lot younger and then brushed them off because it wasn’t “cool” but when i found one this dreamy looking (and for $12!!!!!) i snagged it immediately, even if I only wear it to the state fair for easy access to cash! eileen fischer jersey shift dress – i bought this during the nordstrom anniversary sale and am in LOVE with it. i’ve only wore it once so far since i just got it a few days ago but the fabric is amazing and it’s easy to dress down or up. plus it’s the perfect color to transition into fall! it cosmetics superhero mascara – i’m not kidding you, you’ll have lashes for days with this mascara. i’ve used at least a dozen plus mascaras and i’ve never had my lashes look this full and long. it’s incredible. tiny gold initial necklace – i have received compliments on this necklace a few times because i wear it everyday (or did until my chain broke and i need to replace it). it’s two tiny gold discs with my kids initials on it and i love how simple and dainty it is. keds kickstart leather tennis shoes – a simple super comfy shoe to wear with dresses and jeans and everything in between. keds is doing it right! american eagle midi shorts – obsessed with these shorts. i have two pair and i wear them on rotation at least four times a week when i’m home with the kids. cult gaia ark bag – so funny story about this bag. i bought it when it first came out because it was under $90 and super affordable for such a unique going out bag. well it’s since become the IT bag through the season (seriously every blogger has one it seems) and thus the price has gone up quite a bit. it’s still my favorite summer bag though and i have received more compliments on it than i have about anything else. free people lace racerback bralette – i snagged a few bralettes at the beginning of summer because they were cheap and i thought i would wear them once in a while. turns out i wear them everyday and instead i were a regular bra once in a while. so comfortable and if your bra shows a little it’s no biggy because these bralettes are so pretty and lacy.